Can you believe it is almost Winter, Christmas and the end of 2016? This week I am sharing something I started last Winter and finished before this Winter so I am thrilled. Happily this project goes with last week's Monday Motivation for up cycled projects you can find here. This week and next will not be a collection of items as I usually share. Getting ready and having my family home for the holiday takes more time that I had anticipated. Isn't that always the way it happens? My Monday Motivation is an up cycled wool sweater quilt! Made from 100% wool sweaters that were in my thrifted, gifted or found ( mostly found) stash, I felted the sweaters by washing them in the hottest setting of my washer twice (to be sure) and then I put them through a tumble to seal the deal. The fibers of the wool, when they are submitted to heat, shrink making them tight and able to cut into squares without the fear of fraying. The sweaters are easy to cut into any size square you wish to use! I stitched the blocks together using 1/2 in seam and Aurifil 40wt thread. The sweaters are thicker than quilters cotton and need a thread weight needed to be heavier. Using the high setting , I pressed the seams as open as I could ( it was not perfect) as I stitch it together. When the quilt top was completed, I stitched around the entire top. This is a step I do for all of my quilt tops. I did want to show what the edge of the wool looks like after it is washed. I backed and binded my quilt with a lovely flannel! In no way is this quilt perfect. This is a utility quilt. It is a quilt that is made only to be useful. The family members are already asking who will be the owner of this beauty. Oh my! What a brilliant idea! I can see where this would be a much fought over quilt to snuggle under! 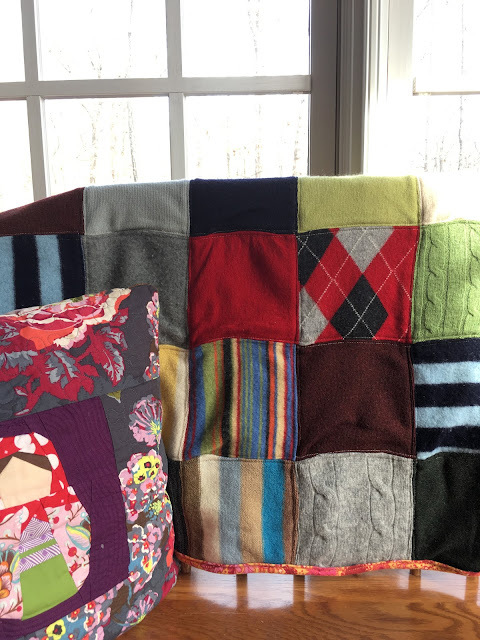 How big did this quilt finish? 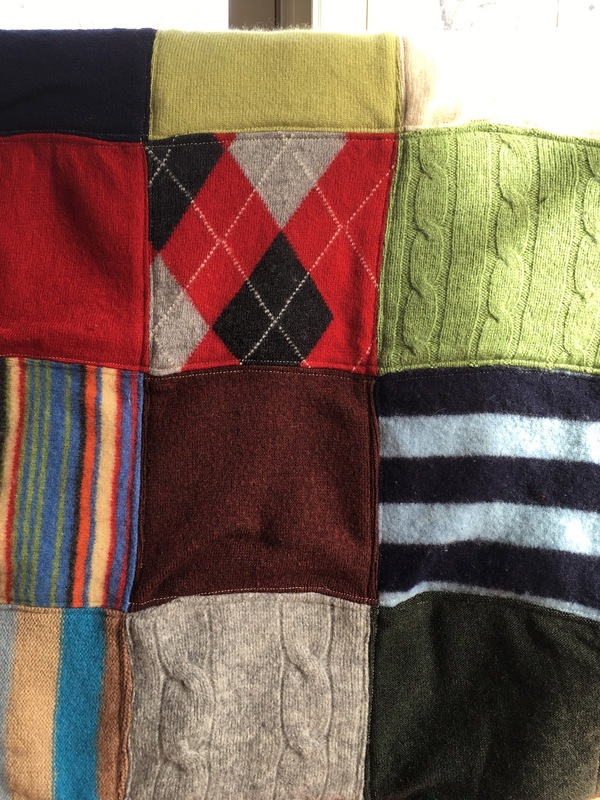 It looks like the perfect winter snuggling quilt. I LOVE THIS QUILT!!!! It's so snuggly and bright! What a different project to work on, and especially fun searching out the sweater that initially go into the quilt. Someone will be especially warm this winter!